He may be old, but our trusty italian plumber is looking brand new in Super Mario Bros U! Here we go again! It feels like only yesterday (4 months to be exact) that I reviewed New Super Mario Bros. 2 on the 3DS, and Nintendo have happily bestowed upon its mushroom popping fan base another Mario game to launch the Wii U. The game sets itself yet again in Holland, where Mario and his friends indulge in their stash of hallucinatory mushrooms, regularly imagining themselves becoming bigger, shooting fire balls from their hands or going hyper on a drug induced star powered trip… ok, so it's not about that, but you know the drill with Mario games. What really happens is that Bowser has come to town on his giant wooden airship. In a twist to shake up his strategy he kidnaps Princess Peach by surrounding her castle in a miasma fog and moat of lava. Mario and his buddies are hurled a couple of miles away and make it their mission to get back to the castle, stop Bowser and rescue Princess Peach. You control Mario via the Wii U’ GamePad, traversing the world before taking on a midway point boss before completing the stage map with a showdown with one of Koopalings. To aid Mario on his journey, he is given two new power-up abilities (aside from the usual trademark power-ups). This time the raccoon ability has been replaced with a “squirrel” power-up that allows our plumber frient to hover in the air temporarily and latch onto walls before pulling off a wall jump. 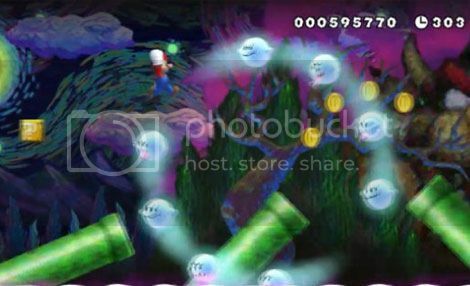 Another ability Mario has this time around is the ability to shoot ice fireballs. I can confirm we can now kill the previously invincible undead koopa troopas. This ability comes in handy later on in the game when you need to access secret hard to reach areas that sometimes have hiden Star Coins. Just freeze the enemies and use them as platforms. The stage maps are the usual fare, we have the starter grass levels, desert levels, water levels, winter levels and so on. I have to say that the incentive as a veteran Mario player to play through the same old formula does start to wane after awhile. Although the levels are masterfully crafted and provide a reasonable challenge for players of all skill levels, I felt like Nintendo still aren't taking any new risks by introducing mind-blowing or interesting level design. There was one level that introduced a spooky forest like ambience with Van Gogh styled cardboard artwork in the background. In fact, the warp pipes in the level were cardboard designed and sunk as soon as Mario jumps on them. One of the warp pipes takes you to an empty room with a lovely painted water colour styled vortex in the background. I felt it a shame that this sort of design hadn't been expanded upon or explored further. However, I will say that my favorite levels were any that contained giant monsters or objects. But there weren’t many levels like this in hindsight. Yoshi also makes an appearance with all his baby Yoshi buddies. He's still overpowered as ever and this is a good thing: there's nothing more satisfying than completely swallowing up and decimating your opponents. Yoshi is relentless and provides a wonderful gameplay dynamic, as per usual. The little Yoshi babies are absolutely fantastic to use too. Their general ability is to aid you in eating ANYTHING that they come into contact with whilst you hold them throughout the level. As well as being a portable bin, they have unique secondary functions such as lighting up hard to see areas, blowing bubbles that convert all enemies into coins or power-ups and turning into inflatable balloons that help you sail over the entire level stage. The single player campaign length was fairly decent for a Mario game. This is basically Super Mario World “HD” - it brought back some great childhood memories, and creates many more for any new fans. There are some retro nods to older fans by keeping the Koopalings largely the same, retro chiptune renditions of musical themes that suddenly flash in and out, and the ghost mansion levels are very reminiscent of the original designs found in their SNES predecessors. Graphically, the game is absolutely gorgeous in high definition. Looking back at the older Mario titles released recently, this is without a doubt the most beautiful looking 2D side scrolling platform Mario game released to date. I dare say that I'd look forward to an HD release similar to the Mario Galaxy series. New Super Mario Bros. U features 1-5 co-op play. I have to say this is one of the more confusing features to praise. Generally when you want to play with more than one player during the game, you are forced to use the old Wiimotes. The player who controls the GamePad becomes either a helping hand or a troll, embued with the power to create multiple random blocks with the touch screen to create platforms or block the rest of the players. One major criticism I have is that many consumers purchased the Premium edition of the Wii U console that comes bundled with New Super Mario Bros. U and a Wii U GamePad Pro controller (That looks like a more robust Classic Controller). Naturally, one would assume you can use this fancy new controller with the game, instead you can’t and anyone expecting to play with two or more players will have to already own Wiimotes. 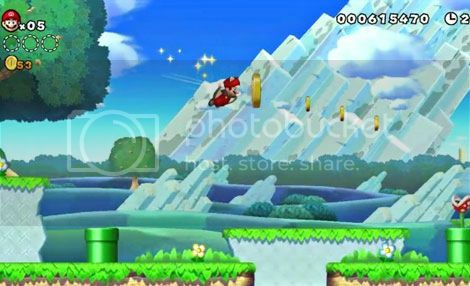 There are various challenge modes that basically consist of time trials where the more coins you collect, the faster the stage will , making it more dangerous in the process. 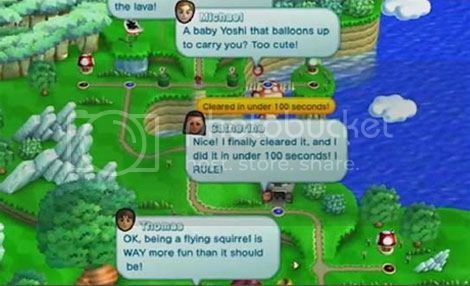 Other new features are the “Super Guide” mode and Miiverse comments that can be added to each level, the latter of which prompts you to post your thoughts to the Miiverse when you complete a level without taking damage or collect all three star coins in a course. You can also allow these posts to be seen visibly on the map so other players to read your thoughts. The success of this feature boils down to the community itself, either taking the piss most of the time or with unhelpful phrases like “Did it like boss” or poorly drawn messages which read “Tihsiz two harrd fu me". However I would like to add that you should check out the “Rabbids Land” Miiverse while you are there as it has basically become a decadent shrine of worship to Willem Dafoe! The “Super Guide” mode appears when you die too many times. It shows you Mario’s bro Luigi controlled by an A.I. completing he level for you. At any point during the A.I.’s progression you can intervene and complete the rest of the level yourself. I really failed to see how this was fun, maybe its just me but I would doubt even little kids would like to admit defeat and just watch their TV as an A.I. completes the level in the slowest, safest and most boring way ever. In conclusion, regardless of my grumbling about the Wiimotes, New Super Mario Bros. U is without a doubt fantastically well designed in every respect. Although I can’t agree that it's an evolution in the franchise (aside from its graphics), I will give massive kudos to the fact that every feature in the game works and has a worthy function of some kind, even if they are optional. The animations are fantastic, charming and beautiful to watch. Mario has literally never looked this good. The stages, although familiar, are crafted very well and offer a fair challenge. The music still has its upbeat charm and all these elements combined give a really solid Mario game. With such a classic title now looking so good in HD, a Legend of Zelda or Metroid game crafted in a similar fashion, complete boasting some juicy HD graphical fidelity spurs my excitement. He may be old, but Mario's looking brand new in this one!